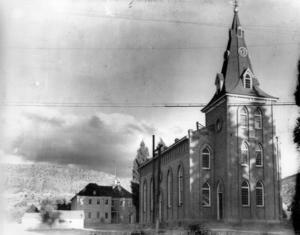 The Cedar City Tabernacle was located on the corner of main street and center street (where the city offices are located today) and was erected in 1885. 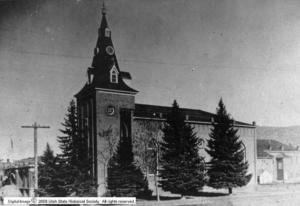 It was demolished in the spring of 1932 to make way for a post office. The Rock Church replaced the tabernacle. 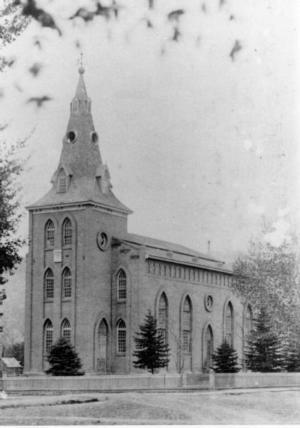 The $29,000 from the sale of the tabernacle went toward construction of the Rock Church, which ended up costing $87,000 (paid through donations and funds from church headquarters). The Rock Church also is home to the old tabernacle’s clock (bought from a Swiss maker with money collected by LDS primary children). The clock still keeps time in the church’s spire. 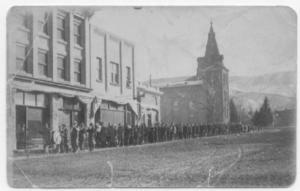 A tabernacle was erected in 1885 on the adjoining corner of Main and Center Street and was demolished in the spring of 1932. 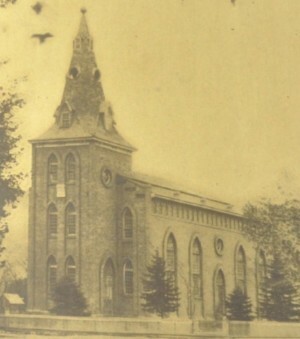 In 1872 Bishop Christopher J. Arthur suggested that this Tabernacle be built to replace the Social Hall. Mayhew Dalley drew the plans for a building 72 X 41-1/2 feet with a tower 110 feet high. Edward J. Ashton of Salt Lake City was engaged as architect and Bengt Nelson was appointed director. 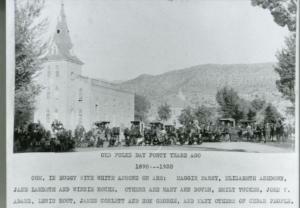 The excavation was dug in 1872, but because labor was needed on the St. George Temple, the work was postponed until 1877. 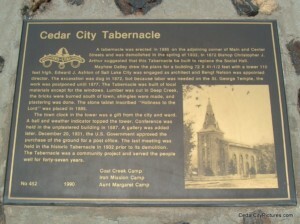 The Tabernacle was built of local materials except for the windows. 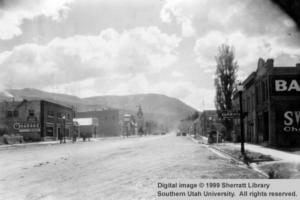 Lumber was cut in Deep Creek, the bricks were burned south of town, shingles were made, and plastering was done. 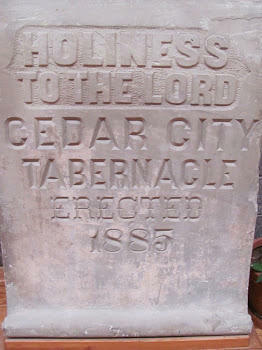 The stone tablet inscribed “Holiness to the Lord” was placed in 1885. The town clock in the tower was a gift from the city and ward. A ball and weather indicator topped the tower. 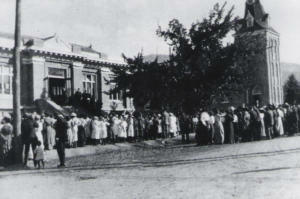 Conference was held in the unplastered building in 1887. A gallery was added later. December 20, 1931, the U.S. Government approved the purchase of the ground for a post office. 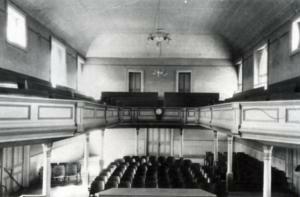 The last meeting was held in the historic Tabernacle in 1932 prior to its demolition. 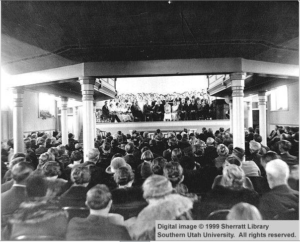 The Tabernacle was a community project and served the people well for forty-seven years.